Last Friday my friend Dana threw a little soirée, which ended up being a gathering of many of our friends. What better opportunity to share some cheese? I put together a little cheese platter, with the Feta, Manchego, Horseradish Cheddar, and Jalapeno Cheddar. Dana also supplied some fig paste, which is a wonderful complement to the Manchego (Quince paste is also great). Overall: Great Success! 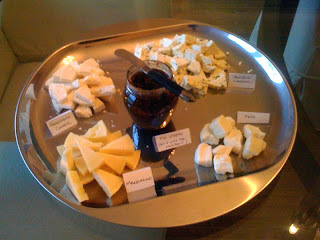 We've been enjoying the Manchego and Feta for a little while now, but this was the unveiling of the two cheddars. They had been aging for just over 2 months, and came out of the wax in excellent shape. Both had a faint trace of pink mold on the surface, which I simply scraped off. The flavor was excellent--thankfully, we guessed right on the Horseradish and Jalapeno quantities. Spicy, flavorful, and intense. I still can't decide which I liked more. The only other thing I still have to figure out is the texture... Both the cheddars were quite crumbly (almost like a Feta! 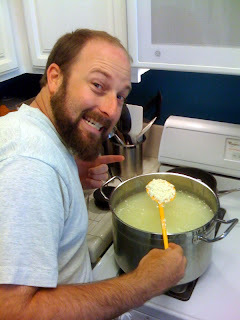 ), while the Feta is too soft and creamy. Darn it, I'll have to try again! 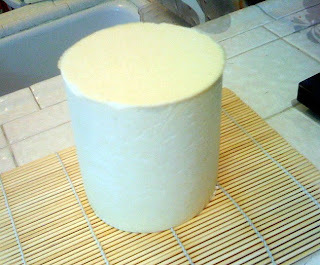 I just finished my first batch of Goat's Milk Feta! Woohoo! I'm actually quite surprised at how easy--and fast--it was. 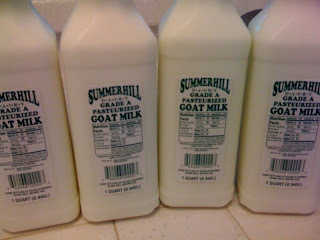 The only tricky part was finding the goat's milk (thank you, Trader Joe!). Otherwise, it's a pretty straightforward process that doesn't even require a press--and is wayyyyyy easier than cheddar! The only downside: At $2.99 a quart, it's pretty pricey. Just for the milk, that's $12 a pound! 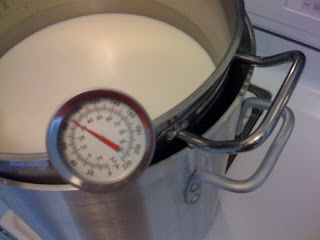 - Heat 1 Gallon goat's milk to 86 degrees, add mesophilic starter. - 1 hour later, add rennet (still at 86 degrees). 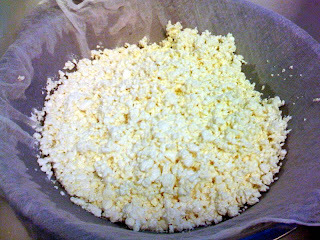 - 1 hour later, cut the curds into 1/2" cubes, let set 10 minutes. - Stir gently for 20 minutes. - Strain into cheesecloth, tie up the corners, and hang for 4 hours. 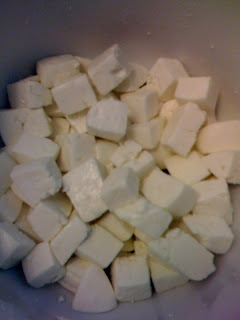 - Cut into 1" cubes, add salt, place in covered bowl in refrigerator. - Wait 4 or 5 days (haven't done that part yet), and then enjoy!